We check in on our big-sister city and like what we find in Washington, D.C. Photography by Scott Suchman. Illustrations by Em Roberts. As much as we love to tout all the things that make Baltimore better than D.C. (we have more personality, everything is cheaper, and we can start a conversation without asking what someone does for a living), it does have some redeeming qualities. Free museums, fantastic food, and public transportation options all come to mind, but there’s something for just about everyone packed into the nation’s capital. Does a trip to Washington really count as travel? That depends on who you ask. But visiting the District, whether it’s for a day or long weekend, is never more than an easy train ride or quick drive away (if the traffic gods are in your favor, of course). Ditch the long travel times and bulky luggage of faraway destinations, and discover what’s new, what’s worth a second look, and what you’ve been missing this whole time, right next door. It’s easy to return to old favorites when business or pleasure calls you south, but we say break away from those tried-and-trues and experience the changes underway in this old standby. D.C. is full of new development, and, luckily, these projects have gone far beyond luxury apartments and city infrastructure. Expansion of the city’s waterfronts and new attractions in nearly every neighborhood mean there are plenty of fresh spots where you can eat, play, learn, and relax all over town. Along the National Mall, art aficionados who have exhausted local collections can look forward to innovative new exhibits at The Hirshhorn. From November 1 through April 2019, immerse yourself in Pulse, the D.C. debut of Mexican-Canadian artist Rafael Lozano-Hemmer, which will visualize visitors’ biometric data through light and sound. Afterward, indulge in a gelato at the on-site Dolcezza and unwind in the recently renovated lobby, which was designed as a functional artwork. For new art outside of a traditional museum, try Artechouse, just a short scramble away near L’Enfant Plaza, featuring large-scale installations that blend visuals and technology into an immersive experience. New Nature by Marpi, on view now, features flora- and fauna-inspired works that respond to visitors’ movements. Just across the way, the buzzed-about National Museum of African American History and Culture has quickly become a must-visit on the Mall. The exhibits celebrating African-American history and contributions to art, sciences, sports, and politics are worth the wait time. Just be sure to check out the special exhibition on Oprah, now through June 2019. While your best bet is probably waking up early to log in and snag a same-day pass online, the museum also periodically releases advance timed passes for the months ahead. Take time to soak up everything you’ve seen a few blocks north at The Dabney, the three-year-old James Beard Award-winning restaurant by chef Jeremiah Langhorne boasting an ever-changing Mid-Atlantic menu. Avoid the I-95 and Beltway traffic entirely by taking the MARC train from Penn Station to Union Station at $16 round trip. 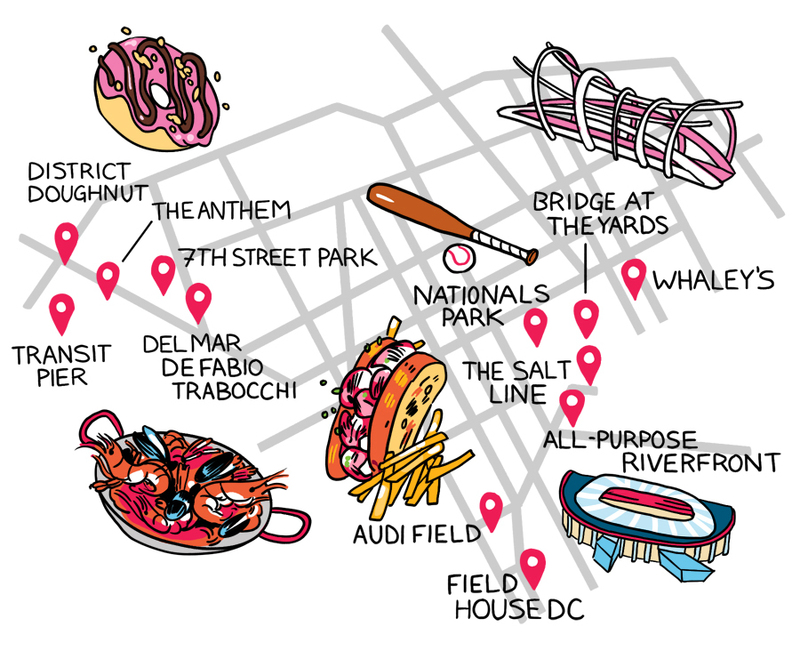 And while the Mall area is a must, Washington, like Baltimore, is also a city of neighborhoods, and those along the Washington Channel and the Anacostia River have exploded in the past year, with great dining and family activities popping up along both waterfronts. 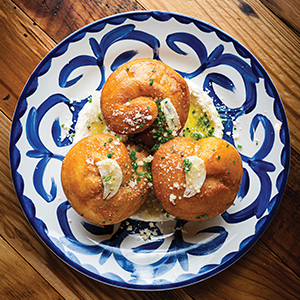 Foodies will flourish at District Wharf on the channel, where options range from seasonal $3 sweets at District Doughnut (brown butter and funfetti never disappoint) up to contemporary seaside Spanish specialties at Fabio and Maria Trabocchi’s Del Mar. 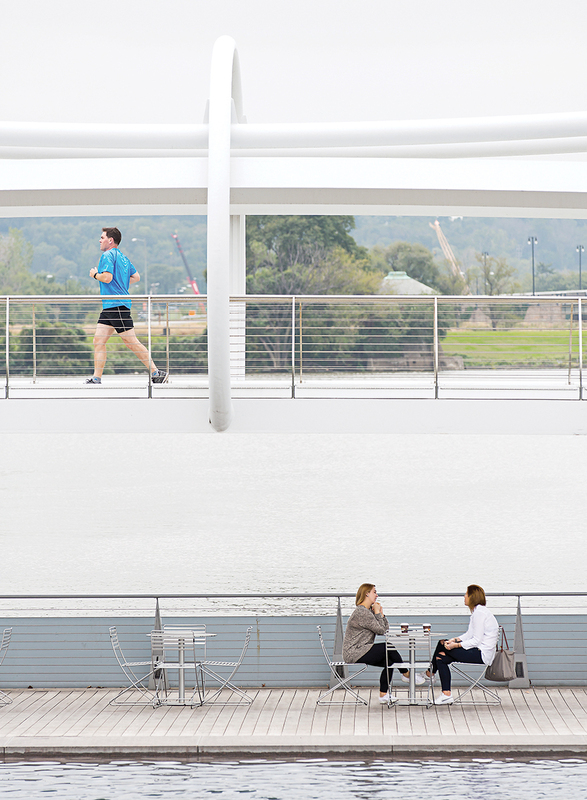 After your meal, stretch your legs in 7th Street Park or swing under the arches at Recreation Pier. Come December, families and couples can also lace up their skates and glide around the Wharf Ice Rink at Transit Pier. 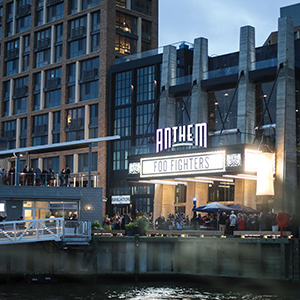 If the kids are at home, top off the night with a concert at The Anthem, the new waterfront endeavor from the folks behind the 9:30 Club and Merriweather Post Pavilion. Grab tickets early to see one of the venue’s big-name acts, such as Young The Giant or Kacey Musgraves. Down M Steet, Capitol Riverfront along the Anacostia River in the Navy Yard neighborhood also offers food, fun, and plenty of spots to take in a game. 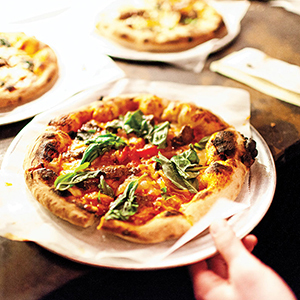 Just outside Nationals Park, you’ll find All-Purpose, a crowd-pleasing pizza spot with patio space and Italian Water Ice cocktails named after Nintendo characters. 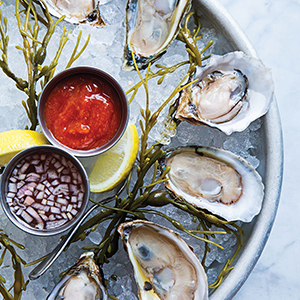 If seafood is more your speed, try The Salt Line for raw bar goodies such as king crab legs and razor clam ceviche, or take a quick stroll up the Riverwalk Trail to Whaley’s, a chic, bright oyster house offering down-home favorites and a must-visit rum cart. We know it’s a sin to support any team other than the Ravens and O's, but for more sports, head farther south to Audi Field at Buzzard Point, the new home of the D.C. United soccer team. The black and red may be done for the season, but the nearby Field House sports bar has your back for local teams' home and away games, which you can watch on a 22-foot screen while sipping brews in the pet-friendly beer garden. oysters at Whaley's; server at the salt line; bar at WHALEY'S; The national museum of african american history and culture; all-purpose; the anthem. That aforementioned construction isn’t just tied to spanking-new spots. City-wide renovations and refreshers are giving some of those time-honored stalwarts a breath of fresh air and some serious staying power. If you’re planning well in advance, keep an eye out for news from the International Spy Museum and the National Museum of Natural History in the new year. 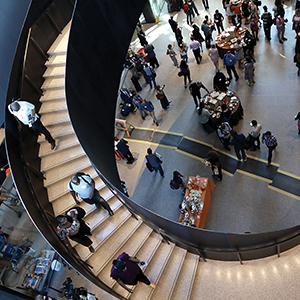 The former will reopen in a brand-new building at L’Enfant Plaza this spring, while the latter will unveil its new Tyrannosaurus Rex display in the renovated David H. Koch Hall of Fossils starting in June. In the meantime, follow the gravel paths of the National Mall to the National Museum of American History. It’s not quite the yellow brick road, but a trip up the escalators to the third floor will bring you to the reopened 3 West galleries, which celebrate American culture. Snap selfies with the Insta-worthy murals by No Kings Collective as you move about the space, but don’t miss all the sports memorabilia, including a classic New York Yankees ticket booth, on your way to visit the long-awaited return of Judy Garland’s ruby slippers from The Wizard of Oz. If you’re used to navigating cars, buses, and tourists on a bike or scooter, grab one of the many available and affordable rentals. Uber and Lyft can get expensive, but both have rolled out their ridesharing options in D.C., so if you’re not in a hurry, share a ride to cut down on cost. A few blocks away on 7th Street, you’ll find the home of another D.C. treasure that looks pretty good in red, the Stanley Cup Champion Washington Capitals. With no hockey team to call our own, Baltimoreans can jump on this trophy-toting bandwagon guilt-free at Capital One Arena. Head down in November and December for rowdy rivalry nights against the Pittsburgh Penguins. For a cheaper option, and maybe some face time with the players, Caps practices at MedStar Capitals Iceplex in Arlington, Virginia, are free and open to the public. 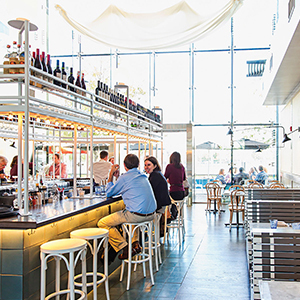 As long as you’re visiting old favorites, wander over to Georgetown for a bite at Jose Andres’ America Eats Tavern, which has found a new home on bustling M Street and still features legacy Mid-Atlantic and barbecue specialties in the cozy space. Arriving early and looking to brunch without the long lines and loud dining rooms? Look no further than The Sovereign, a tucked-away Belgian spot with one of the best beer lists in town. 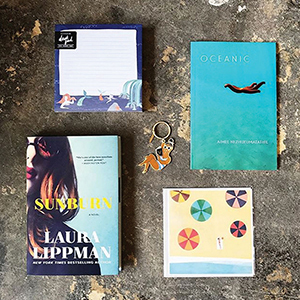 After your meal, walk it off with some window shopping at the new Amazon Books brick-and-mortar or the 40-year-old independent Bridge Street Books with its unparalleled poetry section. Recent additions to Georgetown shopping also include two Canadian favorites: Aritzia, for on-trend women’s clothing, and Roots, for some of the coziest sweats in the game. coffee at songbyrd; rowhomes in adams morgan; thip khao. row 2: A rake’s progress; donburi; thip khao's Seng luangrath. 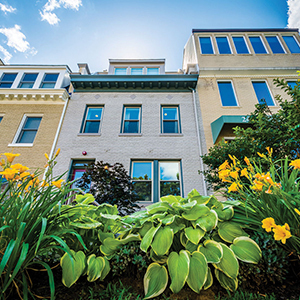 Adams Morgan and nearby Columbia Heights also deserve a second look (especially in the light of day, if you’ve only ever bar-hopped between them). Hop on the Green or Yellow line at the nearest Metro station to get to these eclectic neighborhoods, which offer far more than big-box shopping and bustling nightlife. 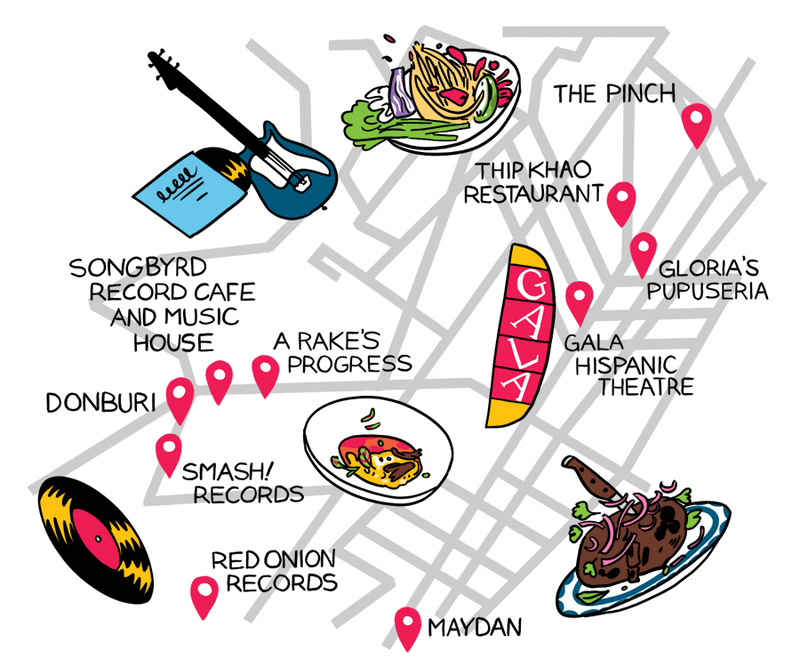 Past the chains, you’ll find that old D.C. charm alive and well with authentic international eats, neighborhood dive bars, and an artistic vibe. Right on the edge of Columbia Heights, crowds line up to dine on the Middle Eastern spread at Bon Appetit darling Maydan. 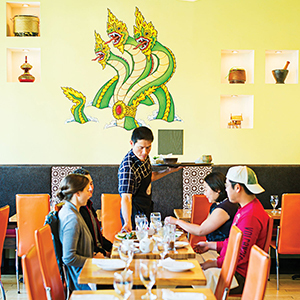 On the other side of the neighborhood, Gloria’s Pupuseria hawks the namesake ooey, gooey Salvadoran comfort food at just $2.25 a pop, while Thip Khao, a family-style Lao joint, serves up fresh salads, succulent noodles, and perfectly spiced curries. 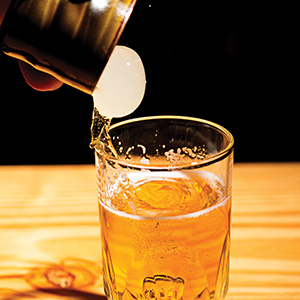 A little farther up 14th Street, wash it all down at two beer bars with personality to spare: The Pinch, which hosts basement punk, rock, and metal shows, and Red Derby, which boasts a covered rooftop, friendly service, and board games. Also see what’s on the marquee at the GALA Hispanic Theatre, a 42-year-old performing arts space with classic and contemporary plays, dance, spoken word, and this month’s annual film festival. 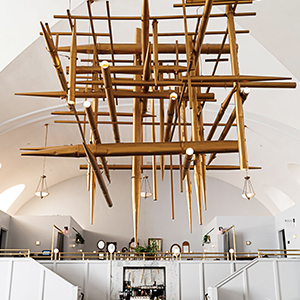 Adams Morgan, just a short walk down Columbia Road from Columbia Heights, is where a neoclassical former church has been converted into The LINE Hotel, home to A Rake’s Progress by Baltimore’s own award-winning chef Spike Gjerde. The once-hallowed halls now offer a different kind of religious experience in the form of exemplary service and well-crafted plates using solely local ingredients, naturally. 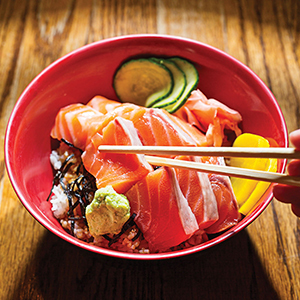 For something easier on the wallet, try Donburi, a fast-casual Japanese spot serving belly-warming bowls to those lucky enough to grab a stool around their intimate open kitchen. 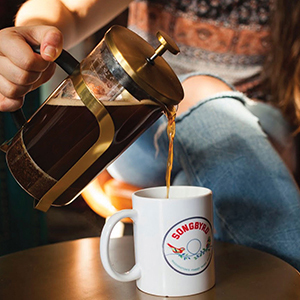 Let the meal settle as you browse new and used vinyl at Smash!, Red Onion, and Songbyrd Record Cafe and Music House, which features live shows and its own coffee roastery on site. 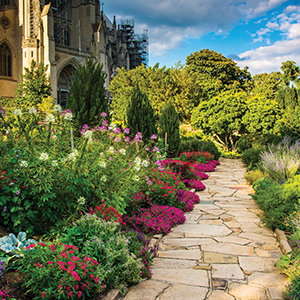 daikaya; beer at daikaya; national cathedral; gardens at the cathedral; comet ping pong; politics and prose bookstore. While we all have our favorite stops throughout the District, there is still an array of spots that have been flying under our radars for years, if not decades. They may not be exactly what you went looking for, but you’ll be awfully glad you found them. Just steps from Union Station is the National Postal Museum, a Smithsonian holding that’s so much more than just an extensive stamp collection, though that’s pretty impressive, too. Rotating exhibits offer glimpses into the lives of historical figures through their mail-related ephemera (current displays cover prolific letter-writer Alexander Hamilton and the stamp collection of a young John Lennon), while permanent collections explore the likes of classic delivery vehicles, from wagons to airplanes, and the U.S. Postal Inspection Service—think fraud detection and anthrax scares. Art-lovers should also explore the recently renovated Freer Gallery of Art and Arthur M. Sackler Gallery, collectively known as the Freer|Sackler, which offer a bounty of Asian art as well as a welcome respite from crowds and field trip groups. Spend time in the Peacock Room, with its elaborate wall art and ceramic collection, and the Tibetan Buddhist Shrine Room, a sacred Himalayan sanctuary. Embrace the Metro. Purchase a SmarTrip Card at any station and load it with what you’ll need in advance. Metro apps such as Transit or D.C. Rider help you choose the best lines for your schedule. 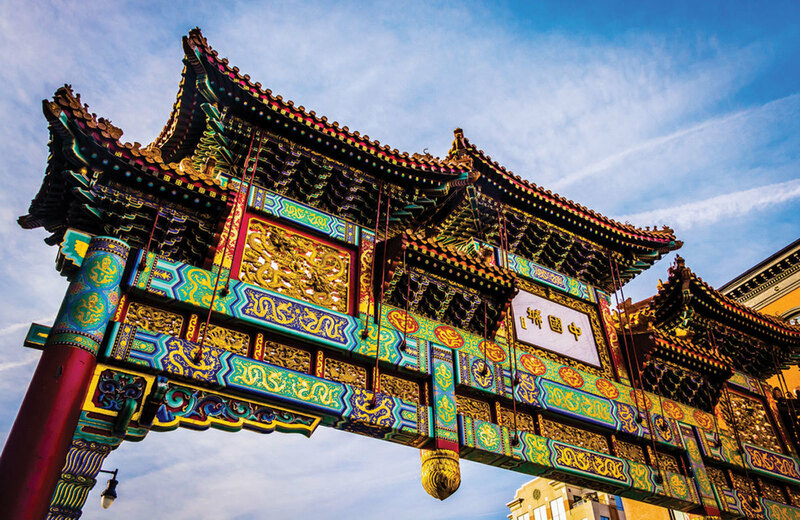 Once you’ve gotten your museum fix, give your brain a break and your belly a reward a few blocks north in Chinatown with an abundance of Asian eateries. 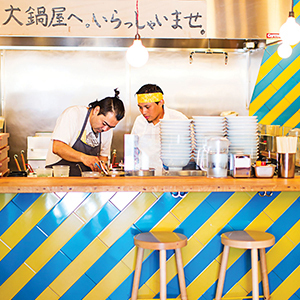 Skip the raucous bars and Friendship Arch photo op and shoot straight to Daikaya for two stories of delicious Japanese fare. Its first-floor Daikaya Ramen churns out Sapporo-style ramen for a quick bite, and its second-floor Izakaya encourages leisurely dining with shareable plates. New Big Wong is the best place to end your night, as the sit-down or carry-out spot is open until 4 a.m. on Fridays and Saturdays. (Whatever time you wander in, order the dry scallop fried rice.) 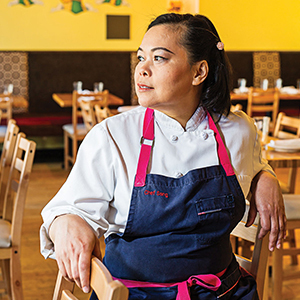 Da Hsin Trading also sells hard-to-find ingredients to craft your own Asian dishes at home. Across town, the city’s Northwestern neighborhoods offer a slower pace with plenty of hangout spots to saunter into between the quiet residential streets and the bustle of interns and students. 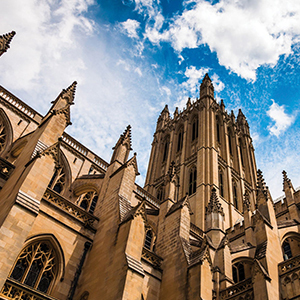 As one might imagine, Cathedral Heights is home to the Washington National Cathedral, a sprawling Neo-Gothic Episcopalian church that is the second-largest in the nation. While the architecture alone is worth a visit, you can also experience themed tours, take tea in the Pilgrim Observation Gallery, or climb the church’s towers for spectacular views of the city. Also swing by the on-site café, Open City, for world-class waffles. Back on the ground, 2Amys is the place for snackable charcuterie plates, vibrant salads, or perfect Neapolitan pizza from its famous wood-burning oven, now back in business after a burst pipe in July. A few minutes north near Van Ness, sate your carb cravings with Sfoglina’s handmade pastas or Bread Furst’s artisan loaves and sinfully good pastries. 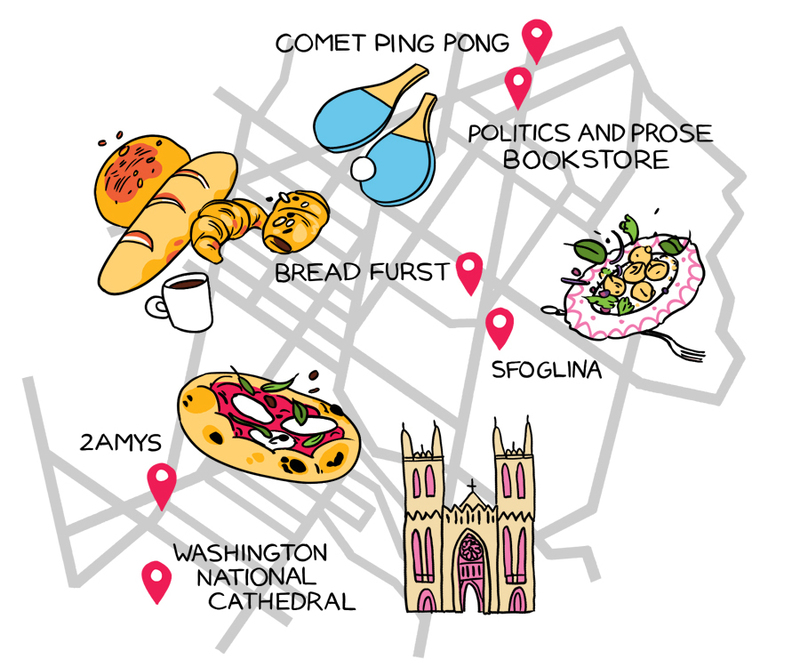 To keep the theme going, a quick walk up Connecticut will take you to Comet Ping Pong, the pizzeria that ought to be known more for its crispy crust and high-quality toppings than a debunked conspiracy theory. While you wait for your table at Comet, take a quick trip to Politics and Prose next door. 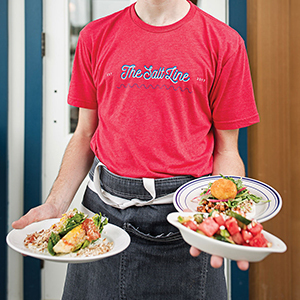 They now have locations at Union Market and The Wharf, but the Northwest location is the original and boasts 9,000 square feet of books and magazines. A place after our own hearts.